The book: Amazing Spider-Man Aim Toothpaste give-away issue. People have been debating about the effectiveness of Free Comic Book Day ever since its inception. The question at the heart of the issue is both basic and obvious: does giving away free comic books actually help create new comic book readers? Well, getting this book gratis back in the day sure didn't hurt. And my parents bought Aim anyway (in fact, I think they still do), so it's not like anyone had to make any out-of-the-way purchase to put this book into my little hands, either. Anyway, this was definitely my first Spider-Man comic book. Probably even my first Marvel book, come to think of it. 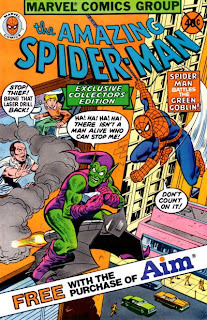 I was already pretty familiar with Spider-Man, though, thanks to his appearances on The Electric Company and the show with Nicholas Hammond (which even by 1980 I knew better from reruns strung together as TV movies than from its original airing), and I was certainly a fan, so getting a whole book with him in it made for some pretty exciting times. I don't really remember a lot of the story, but I do know that what you see on the cover is more or less exactly what you get. There's some sort of fancy new dental laser drill, the Green Goblin - never one to be slowed down by the fact that he had been killed 7 or 8 years before this comic came out - steals it, Spider-Man stops him. Good wins, evil is punished, I'm sure we all learn a little about proper dental care along the way, and best yet, it was free. Even at age 4, that seemed like a successful day to me. Quasi-interesting side note: According to the cover, this was an Exclusive Collectors' Edition. No slapdash reprints for Aim toothpaste, folks... this here's fancy. It might look a little fancier without the big X-ed out price oval, but whatever. And hey, according to the ComicBookDB entry, it was written by Marv Wolfman, and drawn by Alex Saviuk & Mike Esposito, so they didn't even farm this out to the interns. Nice! What was Aim's hook back in the day? Crest had the Cavity Creeps, Close-Up promoted kissing (anathema to an eight-year old boy), and Colgate tried to woo parents with its MFP - Maximum Fluoride Protection.